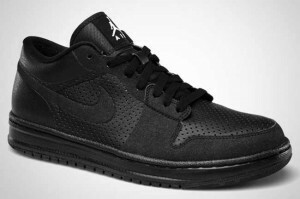 Jordan Brand is looking to give us another good choice before the summer ends with the upcoming release of a new colourway of the Air Jordan 1 Alpha Low this August 2011. With the positive feedbacks it received during the earlier releases, expect this Black/Black – Matte Silver edition of the Air Jordan 1 Alpha Low to be a hot item in the market despite its simple design. The new edition is basically an all-black edition accented with matte silver Jumpman logo on the sole and a white Jumpman logo on the tongue. Yes it is simple but you will surely be awed with its elegance so this should be a must-buy for you this month!